You are here: Home / Aging Dogs: How to Help Your Bichon Through her Golden Years / Are You Dealing with Dog Dementia? Are You Dealing with Dog Dementia? 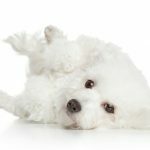 Consider dog dementia or cognitive dysfunction syndrome if your Bichon Frise is over 11 years old and you have ruled out sensory losses like dog deafness or blindness. It is true that older dogs can develop an Alzheimers-like condition which is a form of dog senility. Similar to human dementia, canine cognitive dysfunction is progressive, meaning that it will get worse, in time. What are the Symptoms of Dog Dementia? Just like in people, dogs develop dementia when they have degeneration or a breakdown in the nervous system. Dogs with dementia still need lots of love and attention. Generally speaking, if your dog is starting to be senile, you will see confusion and disorientation. Your dog may not even recognize familiar people and places. With canine dementia, a dog can easily wander away from home and get lost. Repetitive licking – someplace on your dog’s body. She may even lick a spot until it becomes inflamed and sore, with hair loss. Appetite – eating more or less than usual. The same for drinking water. It is important to rule out other conditions. Issues like sight loss, hearing loss, heart disease or the pain and stiffness of arthritis can all have similar symptoms to senility. Unfortunately, if your dog has dog dementia, her condition will just continue to worsen over time. Old dog encephalitis – this is a chronic brain inflammation, seen in dogs that had distemper in earlier years. This can occur, even if your dog had the virus as a puppy and didn’t show symptoms. 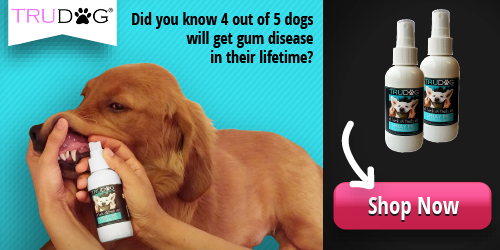 If your dog has one of these conditions, treating the disease may help improve his cognitive skills. How Can You Help a Dog with Dementia? While ways to help your dog are somewhat limited, there are some things that you can do to make things easier for both you and your dog. Don’t move things – keep furniture, your dog’s beds and your dog’s food bowls in a location that is familiar. Moving any of these can be confusing to a dog with dementia. Walk with a leash – When you take your dog for a walk, keep her on a leash. This gives you control and prevents her wandering off or running into danger. MaxxiSAMe – This is a supplement for older dogs. Seems to slow down the progression of dementia in dogs, but also improves liver function, decreases inflammation in joints and improves your dog’s mood. Available at Amazon. Serenity Hemp Dog Chews – a nice way to calm an anxious older dog. Dog treats that relieve pain and stiffness, anxiety and depression and inflammation in your dog’s body. Available here at Amazon. Thundershirt – Thundershirts can be very calming to a dog who is confused and anxious. Similar to being embraced or hugged, it gives a dog a feeling of security and calm. I’d suggest that a Thundershirt could be your pet’s new everyday clothing. Groom your dog often – This gives her needed interaction and affection and does what she probably isn’t doing for herself. Provide mental stimulation – Talk to your dog, practice obedience commands and play with your dog daily. Prevent accidents in the house – If your dog is incontinent, you might want to look into these tips and products. While the prognosis for a dog with dementia is not good, you can still enjoy time together with your dog as she slips into old age.